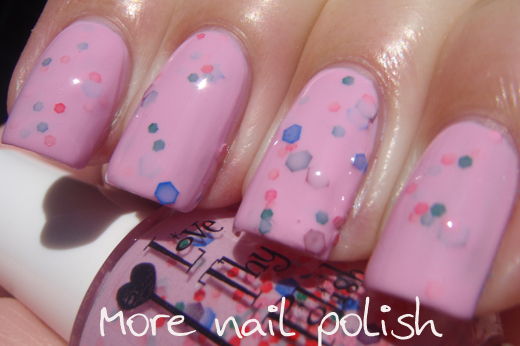 I don't have any more Australian themed nail art to show you, but I do have four great polishes from Australian indie brand Love Thy Polish. 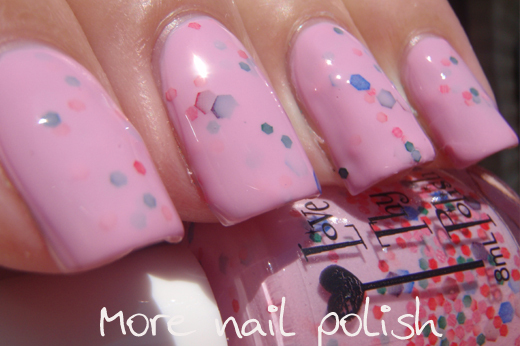 Love Thy Polish is created by Em from Nails in the Desert. The first three shades are already available from her etsy shop, the last one is a new shade that will be available on 1 February. Her regular sized bottles (12ml) are $9 and she also does big 8ml minis for $6. 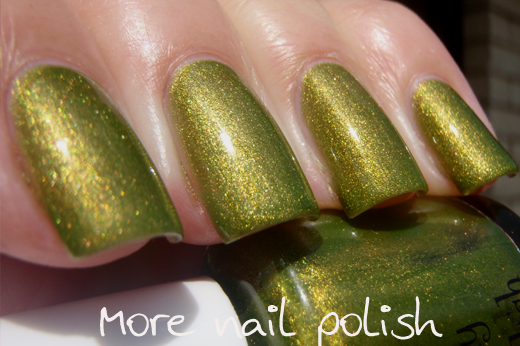 The Golden Flame - a stunning olive green with a rich golden shimmer. 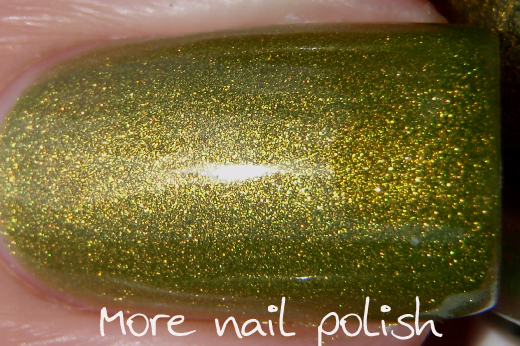 This is three thin coats topped with Seche Vite. The formula was excellent and it applied perfectly and smoothly. 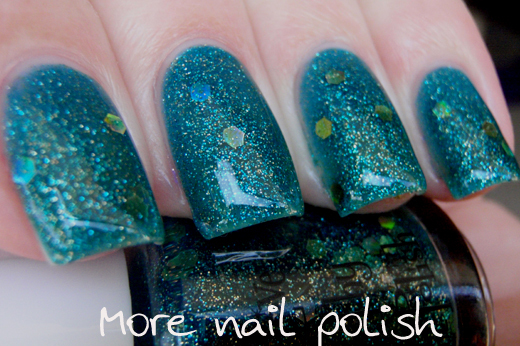 And can I just say, wow what a great colour and the shimmer is really something special. 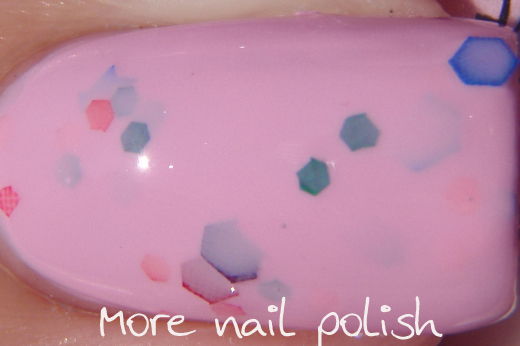 Milkshake it - a pale pink crelly base with a sprinkling of of red, dark green, neon blue, cherry and purple hexes in various sizes. Very pretty and it really reminds me of those iced Arnotts hundreds and thousands biscuits. This was three coast plus Seche Vite. 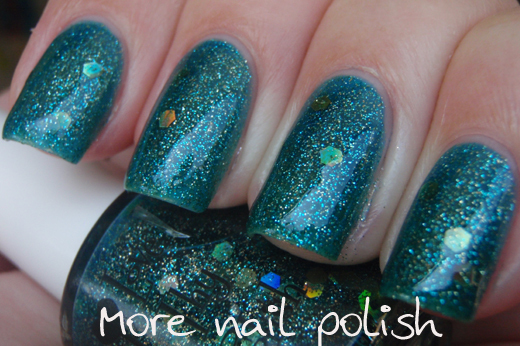 Application was good, but make sure you wait a few minutes before doing your third coat, otherwise you made drag some of the glitters and it will leave marks in the crelly base. The Blue Em & M - this one is a beauty. 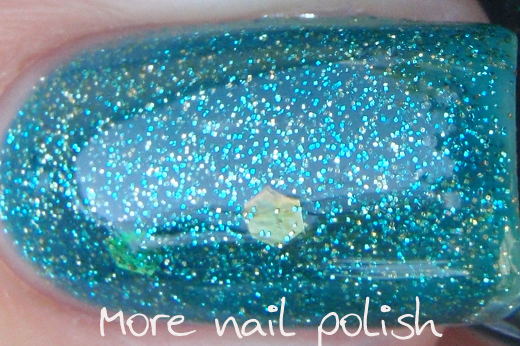 Don't let the name fool you, this is a rich teal green jelly, it is definitly not a straight blue base. 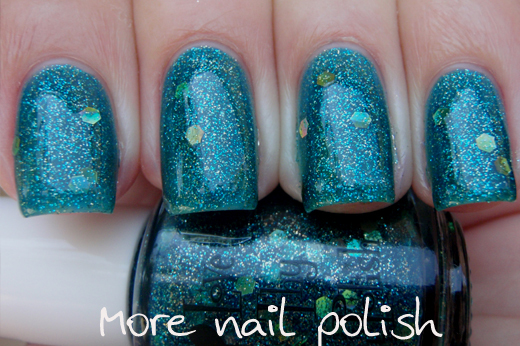 It has gold holo hexes and both gold and blue micro glitter. This is three coats plus Seche Vite. Application was excellent on this one, coverage was great and the larger gold holo hexes spread themselves out really easily on their own. I really like this one! 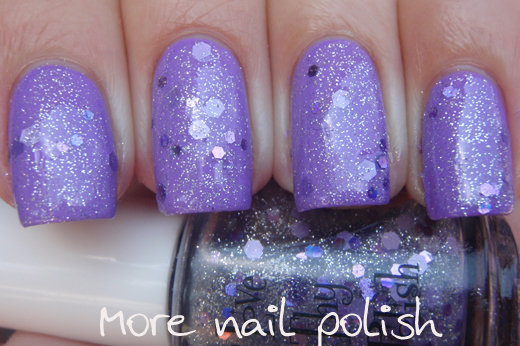 Miss Bossy Pants - is a clear base with silver micro glitter, medium sized lavender glitter and smaller sized holo lavender glitter, which I completely failed to capture. 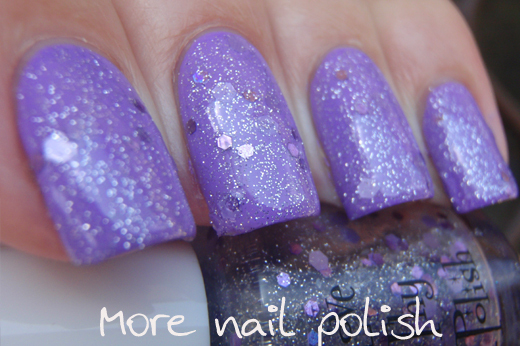 I've layered two thin coats of Miss Bossy Pants over Picture Polish Wisteria, the two colours were perfect together. Milkshate it looks so adorable! wow beautiful colors! love the blue! That first one is amazing! Just my kind of color. Ohhhhh... The Golden Flame is one of those ugly green colors that I wouldn't touch with a ten foot pole in any other medium, but I'm absolutely obsessed with in nail polish. I wonder if it would partially satisfy my Catherine Arley 803 (which is sadly discontinued) lemming? That Golden Flame is fabulous and Miss Bossy Pants is very pretty and the Blue Em & M ... heck I like them all!! 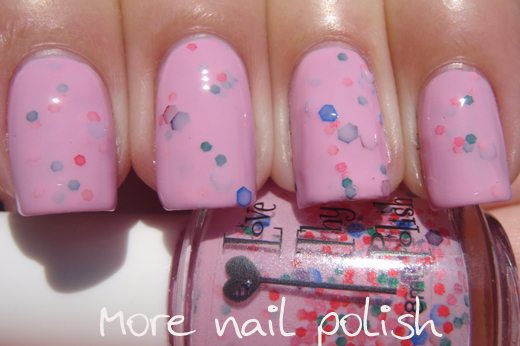 The Milkshake It, really does remind me of some biscuits I used to buy that had smooth pink icing on them and hundreds and thousands embedded in them - just the effect in that polish!